Charlotte makes me smile. She has such a determined and mischievous look about her. And she looks eerily like the Queen. More so than the Queens own children! It is kind of sterile in comparison to the warm and colorful family Christmas scenes shared by Victoria in Sweden, for example. Or like the family photos Prince Frederik and Princess Mar share. How can one be negative on such a beautiful picture?! This is who they are, throughout the year. Staged, sterile and impersonal, in my humble opinion. I agree 100% with you. That's what I thought seeing this pictures. Old photo(Katherine is not pregnant there...)! And very traditional... Not a good portrait. I think Charlotte favors Carole Middleton more than The Queen. I agree. Her eyes are just like Carole's. Whoever she looks like - she is adorable! The photo is gorgeous. But it's dissapointing. It's not recent, half a year old probably. Children would be so grown up by now. True! A beautiful picture of a beautiful family, but no reference to christmas. What a pity! Lovely family picture ...... apart from the background and the missing Christmas atmosphere !!!!! its a lovely and happy family photo...but not the best for the Christmas greetings. Such a boring card. Also it is made a few months ago. Kate looks to photoshopped and where has her right arm gone? Sorry i am not impressed. I thought about that too but it looks very odd and unnatural. i want to sleep just looking at the whole fiasco!!!!!!!!!!! I want to sleep zzzzzzzzzzzzzzzzzzz!!! boring!!!!!!!!!! Christmas really??? boring as can be. There isn't one hint that would make you think "oh it's their Christmas card" Boring as boring can be. Couldn't they have even stuck a Christmas tree or something festive in the photo? Perhaps even dressed a little festive?? Looks like they'll have a rip roaring festive season. I just thought what a sweet photo myself. Not unlike the sweet photo released by Spain's royalty. This is the same couple that released super fun, candid snow pictures one or two years ago. Maybe we will get pics like that again this year. One thing is certain, 2018 brings big changes for this family! I thin that we would think better of the photo if we accept that this is an annual holiday season/new year's ritual rather than a Christmas card. In places like Sweden or Denmark, where the society is more homogeneous, the royal family can embrace "Christmas" and all its symbolism. But the UK is a very multi-religious society going through a period of religiously motivated political turmoil. They have had numerous religiously driven terrorism incidents. This is not a moment to make an overtly Christian gesture and flaunt their Church of England links. They have to be the royal family to everyone. The photo has the sobriety and dignity needed from a couple that just last week went to a multi-faith marker of grief after a fire killed tens of people of various faiths. The Spanish Royal family has also gone rather secular for the holidays for similar reasons. The Scandinavian countries can still go with Christmas full steam ahead but that will become increasingly rare. So sorry, but you could not be more wrong (thankfully). Taking and showing a Christmas photograph as part of their Christmas card is not "flaunting" their Church of England links. I think you are projecting a bit. Totally disagree, Lisa, and I find your post offensive. William, Catherine and children should not have to disguise who they are. They are Christian. William is the future Defender of the Faith of the Anglican Church. If you directed such comments at non-Christians, there would be an uproar. I also disagree with your characterization of Scandanavian countries. Sweden, Denmark and others now have very sizable Muslim populations. They also have significant Jewish populations. The royal families of these countries acknowledge these population facts but still honor their Christian faith and history without fear. In all monarchies in Europe, members of the royal house are baptized in the Christian faith. (Little Prince Gabriel of Sweden e.g. this December). And all countries have freedom of religion, which means that no one needs denying/hiding their faith.... neither the royals! 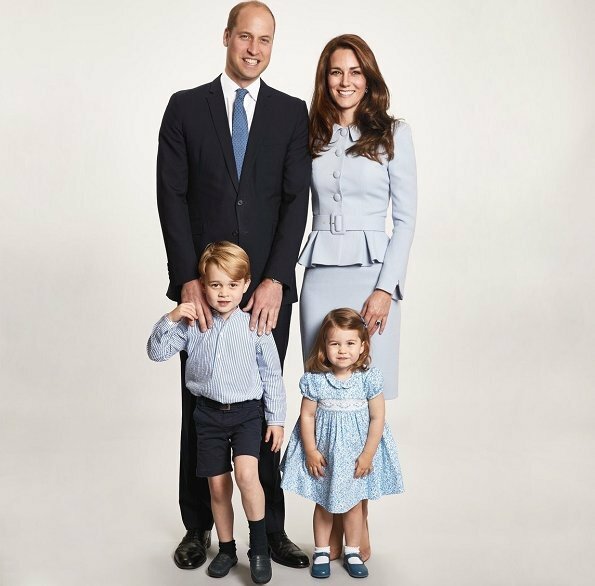 British royals have a pic as Christmas card what means something to them, never any funny Christmassy stuff. Probably their idea is to give a card what can be put to mantelpiece and be watched throughout years. I think this pic is lovely family portrait. Also Charles and Camilla send an old pic taken last july. Maybe Harry and Meghan's card next year will be more lively!! Nice family, but it doesn't look at all like a Christmas card. A stunning photo of a stunning family. They do things their own way and is not a carbon copy of other royal houses in Europe. Just as Prince Harry and Meghan will do things their way and neither will Prince Harry and Meghan be a carbon copy of the Duke and Duchess of Cambridge or the Cambridge family be carbon copy of Prince Harry and Meghan.